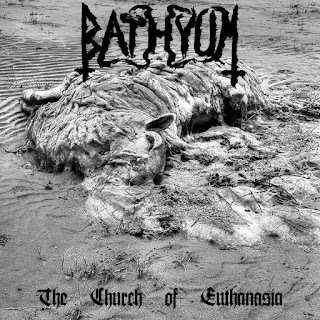 Bathyum are a solo project from the United Kingdom that has been featured before in this zine and plays an old school form of black metal and this is a review of his self released 2018 album "The Church Of Euthanasia". Atmospheric soundscapes start off the album along with some operatic voices start off the album before adding clean playing onto the recording while the drum beats are all programmed before going into a heavier direction which also introduces grim yet high pitched black metal screams onto the recording. When guitar solos and leads are utilized they are done in a very dark yet melodic style while the faster sections of the songs also use a great amount of tremolo picking and blast beats which also gives the music more of a raw feeling along with the riffs also utilizing dark sounding melodies as well as most of the tracks being very long and epic in length, spoken word samples and growls can also be heard briefly and the music is very heavily rooted in the 90's era and as the album progresses acoustic guitars can also be heard on some of the later songs. Bathyum creates another recording that remains true to the old school style of black metal that was on his previous release, the production sounds very dark and raw while the lyrics cover suicide, murder, celestial entities, paganism and old folklore themes. In my opinion this is another great sounding recording from Bathyum and if you are a fan of old school black metal, you should check out this album. RECOMMENDED TRACKS INCLUDE "Penance" "Witches Of Bidston Hill" and "Ceremony Of The Pagan Queen". 8 out of 10.